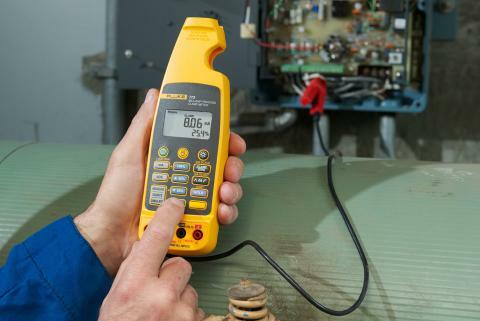 Use the Unified Power measurement feature and the Energy Loss Calculator on the new Fluke 430 Series II Power Quality Analyzers to determine how much power is affected by harmonics and load unbalance. At the same time, utilities in the United States began customer service campaigns aimed at helping facilities make better use of the power they were consuming. Why would a utility want to help customers lower their bill? Because capacity is limited. Given the regulatory framework, length of project time, and sheer cost to build new power-generation facilities, utilities have a vested interest in extending the reach of their existing generation capacity. To keep adding new customers to the grid, existing customer usage has to be optimized. Oil platform and nuclear meltdown disasters have only served to underscore how limited the options are. In the last four years, most mid-range facilities have been taught by their electrical utility to better understand their monthly statement, and have possibly done a basic energy audit to determine how much energy various operational functions consume per month. Many facilities have identified "low-hanging fruit" available to be harvested: In other words, energy consumption that can be decreased without substantial investment. Common examples include: shutting off equipment and systems overnight, instead of leaving them on; upgrading lighting systems and large loads such as chillers to high-efficiency models; taking advantage of government energy-efficiency subsidies; fixing leaks in compressed air lines; and adding controls to match mechanical equipment output to performance requirements. In parallel with these developments, the IEEE power quality standards body began an assessment of the academic work necessary to more accurately segment and quantify energy consumption in three-phase electrical systems. This assessment began more than a decade ago. It had been known for many years that there were gaps in the mathematical model underlying classical three-phase power measurement calculations. In particular, the effects of reactive power, harmonics, and load unbalance were not considered in the classical methods used in most power quality and consumption monitoring. At that point in time, harmonic distortion and load unbalance were viewed as imperfections in the purity of power that caused equipment performance issues, and in the case of power factor, diminished the usability of the distributed power. Quantifying the amount of power made unusable had never been considered. Harmonics and unbalance were troubleshooting concerns, not energy consumption issues. That is, until energy became a premium product. If 100 kilowatts come into a facility and a portion of those kilowatts is made unusable by poor power quality, the facility pays for 100 kW but is only able to use 100 kW minus the wasted portion. If the waste could be quantified, and multiplied by the utility rate schedule, then it would become clear whether the amount of waste was expensive enough to merit fixing the power quality issues. The outcome of the IEEE efforts was a new standard, IEEE 1459-2000, that went some way into enabling the calculation of waste because of power quality, but in a very academic framework. Still missing was a clear definition of the physical quantity of power waste. Shortly after the new standard was issued, two professors at the Polytechnic University of Valencia in Spain set out to develop the math necessary to quantify power waste because of harmonics and unbalance issues. First, Professors Vincente Leon and Joaquín Montañana developed mathematical methods based on the recommendations of the IEEE 1459-2000 standard that defined the sources of specific wastes. Then they developed a measurement instrument with a computing system that calculated what they described as Unified Power. Their breakthrough Unified Power measurement method took the best aspects of the IEEE 1459 recommendations and calculated the energy-wasting effects of reactive power, harmonics, and unbalance in the electrical system. Fluke learned about the breakthrough and approached the professors about a partnership. Together, Fluke engineers and the professors transitioned the science from an academic instrument into a Unified Power measurement feature and an Energy Loss Calculator, now available in a portable handheld power quality analyzer. Both parties hold patents, for different aspects of the new capability . 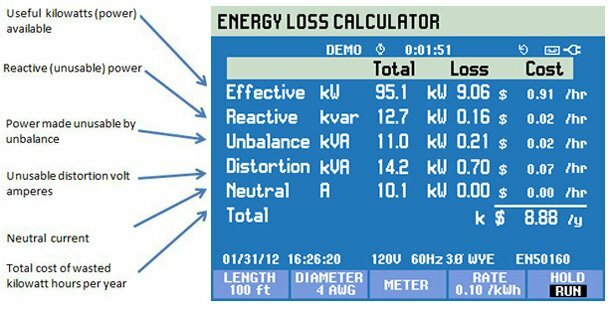 The Unified Power measurement system expresses power and energy measurements that directly quantify the waste energy in electrical systems using a combination of classical methods, IEEE 1459-2010, and the Polytechnic University of Valencia's mathematical calculations. Unified Power measures harmonics and unbalance waste in kilowatts. By factoring in the cost of each kilowatt hour, it's possible to calculate the cost of waste energy over a week, a month, or a year. How do harmonics waste power? One of the most recognized effects of harmonics in electrical systems is the excess heat they create in the conductors carrying them. Many studies have shown the need to increase the size of neutral conductors in power systems to compensate for high current carried in the neutral of 3rd harmonics and their multiples. There are also documented cases of transformers overheating because of the presence of harmonics. That heat is a form of unintentional power consumption. With this new method of calculation, it is possible to quantify the amount of waste in watts, rather than heat. Why does load unbalance waste power? In the case of three-phase motors, unbalance degrades unit performance and shortens life span. Voltage unbalance at the motor stator terminals causes phase current unbalance far out of proportion to the voltage unbalance. Unbalanced currents, in turn, lead to torque pulsations, increased vibration and mechanical stresses, increased losses, and motor overheating. Each one of these effects consumes energy, now quantifiable in watts. Field testing Unified Power: How much waste is there? Professors Leon and Montañana carried out multiple field studies to confirm their hypotheses about the link between power quality issues and the effect on energy waste. 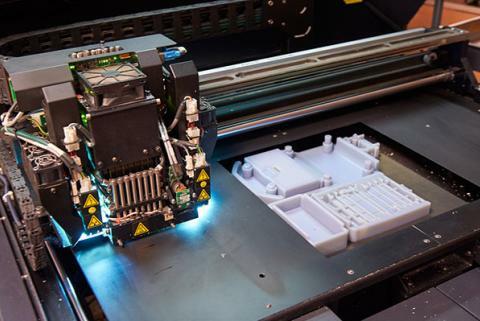 When Fluke joined the partnership, the team conducted more studies to test whether the new capability could be made usable to people outside of the highest-end electrical engineering professionals. Two studies of particular note occurred at anindustrial park and at an automotive manufacturing plant. The industrial park is supplied by a local electrical cooperative. It's a mixed industrial park with a variety of electrical needs. 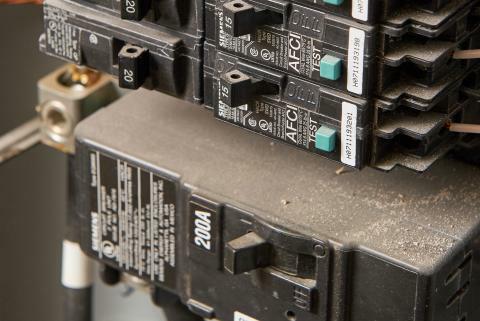 Some of the park's customers had significant inductive loads and the utility had already chosen to install power factor correction to reduce the effects of the poor power factor. However, when the professor's Unified Power device was connected, it showed significant reactive power losses in the secondary of the power transformer in the park. The losses occurred primarily at night, when the inductive loads were not operating, but the power factor correction capacitors were. The energy losses were measured at 353.6 kWh per day (on average); multiplied by the utility's rate schedule, this amounted to $14,000 per year. With this information in hand, the utility and the park manager devised a solution involving time-controlled relays that disconnected the capacitor bank at night. Payback time: less than one year. A study was also devised for a large automobile plant. 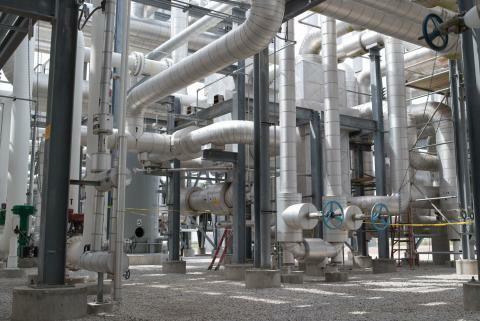 Six separate areas of the plant were surveyed, and numerous causes of energy waste were identified across the plant, including reactive power from discharge lamps and lightly loaded, inefficient transformers. The total waste amounted to $50,000 per year. By installing power factor correction on the discharge lamps and rationalizing the transformer arrangement, and by using one high efficiency transformer instead of five lightly-loaded inefficient transformers, the plant achieved significant energy savings. So, substantial energy really is wasted by harmonics and unbalance. What do you do about it? Addressing harmonics and unbalance typically requires the support of an electrical engineer and staff or contract electricians. Resolving harmonics involves some kind of mitigation equipment or changing the type of electronic equipment in operation. Resolving unbalance requires re-distributing loads, installing unbalance compensation equipment, or sometimes increasing overall electrical distribution system capacity. With the new Unified Power capability, costing out the labor and equipment necessary to abate the harmonics and unbalance, compared to the amount of energy wasted, is a relatively straightforward ROI equation. Keep in mind that installing a harmonic filter will also improve overall power quality by increasing overall equipment reliability, efficiency, and life span, and decreasing downtime. It used to be that you couldn't fix what you couldn't see. More recently, the adage might have been, you wouldn't fix what you couldn't justify. Now, seeing is believing, and the fixing is easy. 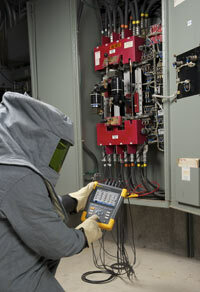 A version of this article previously appeared in Maintenance Technology.